You are here: Home / Health Risks / Anaphylaxis, Allergies, and Asthma / Can Vaccines Cause Immune Dysfunction Resulting in Allergies, Asthma and Anaphylaxis? Clearly, the Institute of Medicine has not ruled out the vaccine connection to allergic disease. Link to the Full IOM Report (free download) here. Thank you for the opportunity to submit the following information for your review of the possible association between multiple immunizations in newborns and infants and immune system dysfunction. We are writing in particular about the potentially life threatening allergic response called anaphylaxis. Why the “surge” in anaphylactic children entering school a decade ago? These children were among the first to receive an additional vaccination, Hib meningitis. Is it possible that the Pertussis and Hib vaccine, both shown below to cause allergic responses, are creating a hypersensitive immune system in some children? Has any study looked into what happens to atopy incidence and IgE levels when 5 vaccines are given concurrently in infants? Women have been ingesting peanut protein while breastfeeding for decades. What has changed in the last 15 years to cause infants to develop life-threatening allergies to this legume? One change has been the vaccination schedule. Does this study explain why babies and toddlers react on their first exposure to the peanuts or other antigens? The babies may have been sensitized by the vaccines to the proteins through breast milk or formula ingested at the time of vaccination. This would also explain why children are anaphylactic to a variety of proteins, such as different tree nuts, peanuts, egg, legumes, milk, seeds, etc., depending on what proteins the mother ate at the time of vaccination. IS THE INTRODUCTION OF THE HIB VACCINE CONNECTED TO THE INCREASE IN FOOD ANAPHYLAXIS IN CHILDREN? Rates of anaphylaxis have increased dramatically since the introduction of the Hib vaccine. DOES THE PERTUSSIS VACCINE CAUSE ASTHMA, ALLERGIES AND ANAPHYLAXIS? Pediatrics 1988 Jun (81) Supplement – Report on the Task Force on Pertussis and Pertussis Immunization – extract states, For more than 25 years, it has been known that pertussis vaccine is a reliable adjuvant for the production of experimental allergic encephalitis. CAN VACCINE ADJUVANTS CAUSE ALLERGIES AND ANAPHYLAXIS? Requests for information on the types of adjuvants currently used in human vaccines have not been answered to date. We did find that adjuvants are used to create allergic animals for scientific study and also that peanut oil has been used as an adjuvant. Peanut is by far the most common food to cause anaphylaxis in young children. Is peanut oil, or a similar protein or portion of a protein used in human vaccines as an adjuvant or “protein coat” in the Hib vaccine? Aluminum has also been used as an adjuvant and is known to cause allergies according to the studies below. Could the adjuvants used in vaccines over the last 15 years be creating anaphylactic and allergic children? ARE MULTIPLE VACCINES CAUSING OUR IMMUNE SYSTEMS TO FAIL? In conclusion, living with anaphylaxis is to be continually on guard for minute quantities of everyday food or other substances that may cause death. Keeping anaphylactic children safe involves the whole community including the child, parents, teachers, bus drivers, caregivers, friends and family. It is our hope that the Committee will investigate the questions we have raised and will recommend further investigation into the connection between vaccines and this most distressing allergic disease called anaphylaxis. What is being injected into our children? Why can’t we find out? What adjuvants are used in the vaccines? Health Canada eventually sent the vaccine product monographs, which list some ingredients of the vaccines but not all. This is an absolute outrage that parents cannot received full disclosure of vaccine ingredients being injected into their children. This is not “informed consent”. 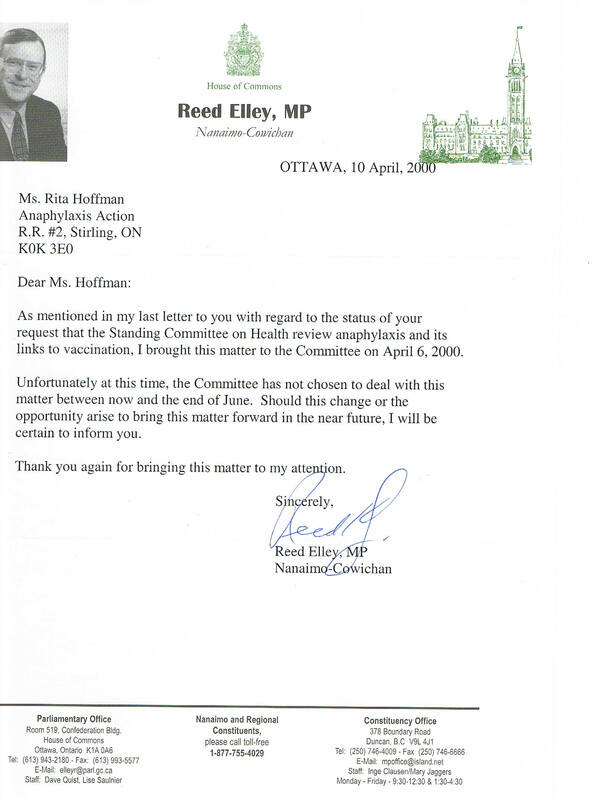 Health Minister Allan Rock, in response to a plea to investigate the connection between anaphylaxis and vaccines stated in a Jan 2001 letter, “As stated in my previous correspondence, there are many causes of anaphylaxis.” The letter concluded with “Severe anaphylaxis happens infrequently (after vaccination) and is rarely fatal.” There was no mention of the epidemic of 3-5%, and now reports of up to 8% of children in this country who are anaphylactic. Anaphylaxis needs to be prevented! Call and write your health officials! Show this web site to your doctor! DEMAND PROOF THAT THE NUMEROUS VACCINES THAT HEALTH OFFICIALS WANT YOUR CHILD TO RECEIVE WILL NOT CAUSE LIFE THREATENING ALLERGIES OR ASTHMA! Send comments and questions to Anaphylaxis Action. If you are a health official or medical doctor and would like to have your evidence that vaccination is not the cause of anaphylaxis placed on this website please contact Anaphylaxis Action.